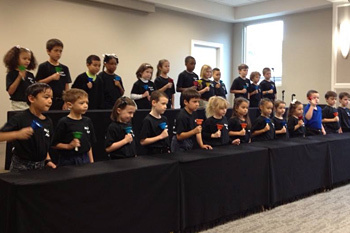 This is the primary level handbell choir that incorporates all of the students in grades K-3. Basic musical concepts are introduced, and the students have lots of FUN! They love to perform for chapel as well as other school and church programs. Students in both K-3 and 4-8 are engaged in many opportunities to sing in the classroom, for our school and church family, and during outreach programs. The students in grades 7-8 have leadership roles in the weekly chapel song service. Gale Boughman, one of our parent volunteers, has worked with handbells for many years. Our intermediate and advanced bell choirs allow the students in grades 4-8 to continue to refine their love for playing the handbells. Students learn note reading, rhythms, and counting as they prepare pieces to share with our church, school, and outreach opportunities. In the Spring, the bell choir students in grades 5-8 have the opportunity to attend the Carolina Conference Music Festival and participate as part of a larger ensemble. Mr. Green, the band teacher at Fletcher Academy, brings his enthusiasm and talents to work with our students each week. Any student in grades 4-8 who has an instrument and eagerness to learn is eligible to participate in band. For more information on the band program or where to rent instruments, please contact Mr. Green: sgreen@fletcheracademy.com. Private piano lessons are available through Mrs. Bailey for children in the first through eighth grades. Lessons are conducted at the school and are after school hours. Please contact Mrs. Bailey for more information. The EAS Drama group begins in the summer with drama/gymnastics camp. This year the students have prepared a combined gymnastics/drama program entitled “Salute to America.” The focus of this group is to learn speaking and gymnastics skills while also emphasizing teamwork and a sense of group belonging. There will be several performances for our school family as well as outreach trips into the community.